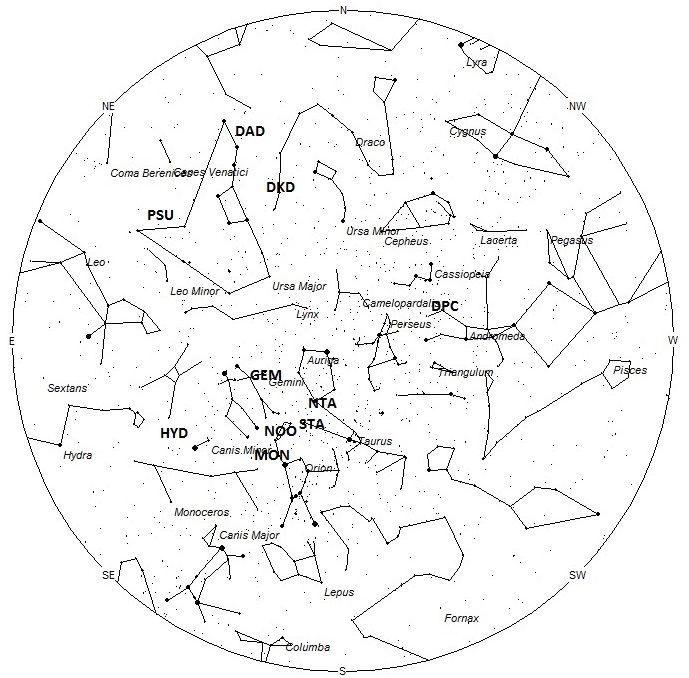 The December phi Cassiopeiids (DPC) are the classical return of the Andromedids and the radiant that was active prior to the breakup of comet 3D/Biela in the 1840’s. This source is active from November 28 through December 10th. Maximum activity is expected to occur on December 6th when the Earth passes closest to particles released by 3D/Biela in 1649. The expected radiant is located at 01:36 (024) +50 on the night of maximum activity. 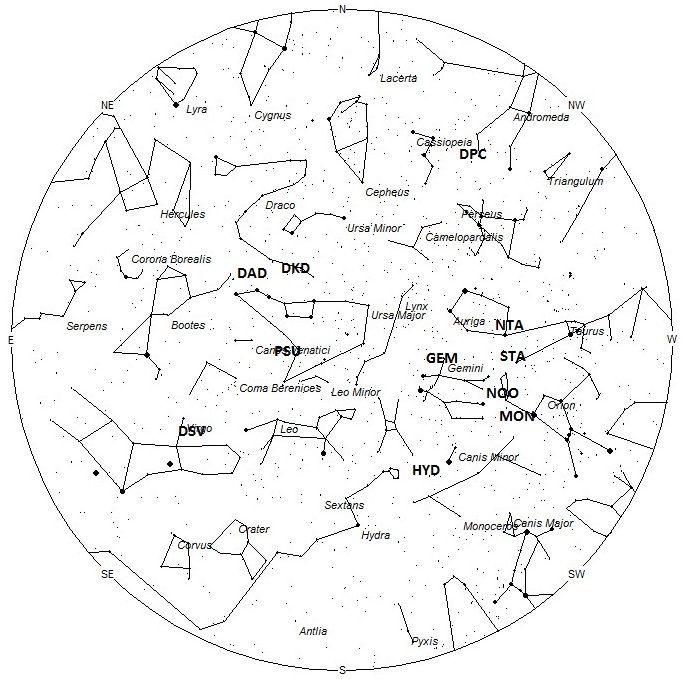 This area of the sky is located just northwest of the 4th magnitude star known as Nembus (51 Andromedae). 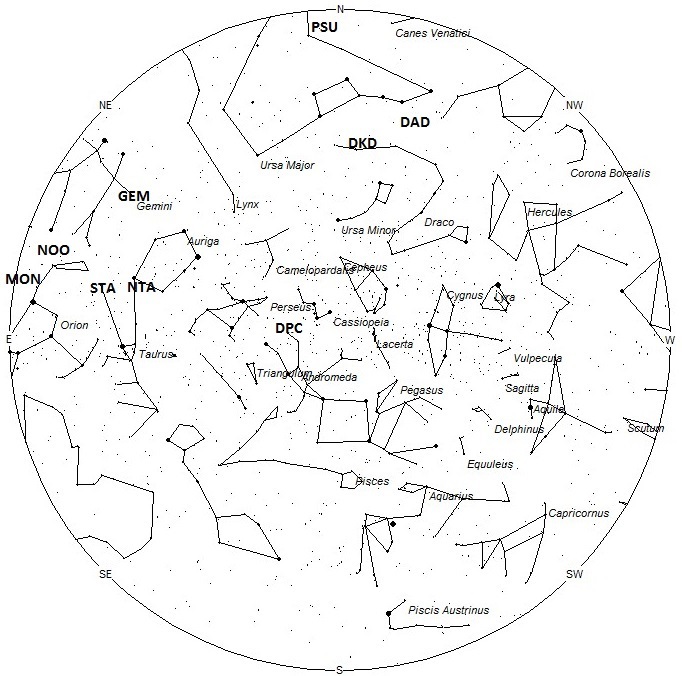 This position is also very close to the border with Cassiopeia and in some years the radiant lies in Cassiopeia, hence the name of phi Cassiopeiids. These meteors are best seen near 2100 Local Standard Time (LST). Meteors from the December Phi Cassiopeiids strike the atmosphere at 17km/sec., which would produce meteors of very slow velocity. Expected rates would be low away from maximum. No one exactly what to expect at maximum. Rates could be strong but the meteors may be faint and difficult to see. Therefore those viewing from urban areas may see nothing at all. At only 17 km/sec. the December phi Cassiopeiids would also produce extremely slow meteors. CAMS Mechelen 12-13 Aug 2016: 686 meteors on 4 cameras!